A beautiful gift pack containing three bottles of 20cl of the Jameson range, ideal to discover the various expressions of the famous Irish whiskey. 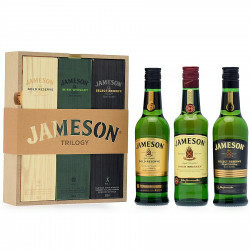 A beautiful gift pack containing three bottles of 20cl of the Jameson range, that offers the opportunity to discover the various expressions of the famous Irish whiskey. Jameson Irish Whiskey: the original expression of Jameson with its triple distillation and strong percentage of Pure Pot Still Whiskey. Jameson Select Reserve: the result of an exceptional blend of high quality Pure Pot Still whiskey and grain whiskeys selection. A rich and complex whiskey. Jameson Gold Reserve: symbol of the brand's expertise, it is an harmonious, peculiar and creative blend of three whiskeys aged between 10 and 20 years old. It has been recognised by critics as one of the best whiskeys in the world.